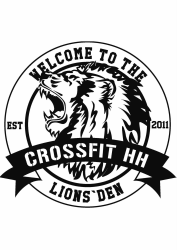 Drop-ins are only available for experienced CrossFitters that are in town for business/holiday or have just moved to Hamburg. If you have not done CrossFit before please fill out a request for an Intro session here. Costs for Drop-ins are 20 euro/session, 60 euro/week, 229 euro/month or 180 euro for 10 sessions. How long have you done CrossFit? Which CrossFit Affiliate do you currently train at? which area (hip, shoulder, back)? what movements you need to avoid (if known)? What Can you expect during your drop-in? You may join our Fit30 (Beginner), Fit45 (intermediate) or Fit 60 (advanced) classes, based on your level of experience, but don't worry we will scale and modify the workout to what is best for you. We ask that you arrive 10-15 minutes early so we can process your drop-in and you can fill out our waiver. We also have a mobility/warm-up area so if you need some extra time to foam roll, iron scap etc. or just want to jump on a bike/rower to get a bit warmer you can do so. The coach will warm the class up together at the beginning of each class, we will review proper technique and work through some progressions or work-out prep before starting the WOD/Lift/Skill. After the class you can perform the daily Rom-Wod in the mobility/warm-up room if you desire. Additional lifts or skill work can be done after the class if coordinated with the Coach. The costs for Drop-ins are 20 euro/session (or free if you purchase a t-shirt: 30 euro) or 60 euro/week. We are a short walk from the U/S bahn Barmbek which is serviced by a number of buses but also the U3 and S1 subway/metro lines. The station is roughly 12min from the airport using the S1 line (every 10min), 12min to the Main Train Station (hbf) using the U3 line (every 5 min) or S1 line (every 10min) and 20-25min from the Messe (conference halls) by U2/U3 or U2/S1. The Box is located about 300m (less than a 1/4 mile) from the Barmbek station. Exit the station onto Pestalozzistraße and walk east for about 200m. You will take a right onto Steilshooper Straße and continue straight for about 100m south (just beyond the train bridge) to reach the box. If you are arriving by car there is parking available on site.